Romans 12:1 – And so, dear brothers and sisters, I plead with you to give your bodies to God because of all He has done for you. Let them be a living and holy sacrifice—the kind He will find acceptable. This is truly the way to worship Him. 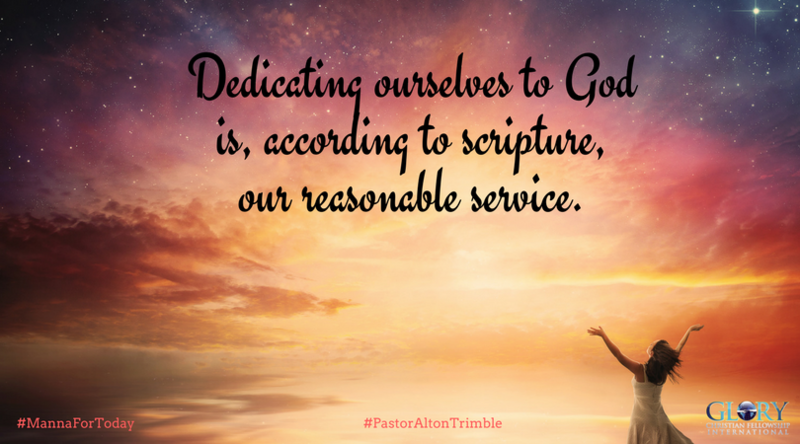 Dedicating ourselves to God is, according to scripture, our reasonable service. Focus on what God wants us to start with; it’s our bodies. Where we are physically affects every other detail of our lives. 1. You can cleanse your body. • Detox it physically and spiritually. • Stop the input of toxic things mentally, emotionally, physically and spiritually. II Corinthians 7:1 – Because we have these promises, dear friends, let us cleanse ourselves from everything that can defile our body or spirit. And let us work toward complete holiness because we fear God. 2. You can take care of your body. • Commit to better stewardship of your body. Ephesians 5:29 – No one hates his own body but feeds and cares for it, just as Christ cares for the church. 3. You can take control of your body. • Don’t work for it, make it work for you! I Thessalonians 4:4 – That each of you should learn to control your own body in a way that is holy and honorable. I Corinthians 9:27 – I discipline my body like an athlete, training it to do what it should. Otherwise, I fear that after preaching to others I myself might be disqualified. Set a goal in each of these three areas of managing your body and allow God to bless you! Just an amazing Manna for today, Lord thank you for it. Lord help me and family to detox these bodies of ours and be better stewards of them. Help us to cleanse physically, spiritually, mentally, and emotionally so we are holy and honorable. Help us to be examples to others. In Jesus Mighty and matchless name, Amen! Father, thank You for your manna today. Continue to help me take care of my body, your temple, so that I may continually grow spiritually and mentally in order to live out Your purpose for my life.. In the name of Jesus, Amen. Heavenly Father, thank You for the gift of this body. Please, help me to honor you with all I do for it and to it. In the name of Jesus, Your Son, I pray. Amen.